Whoop whoop…..I am excited because this is the last week for the #AtoZChallenge2017. I have enjoyed doing this so far and it has taught me ‘discipline’ on another level. I will definitely write a post about my observations during the #AtoZChallenge but let’s move on to today’s entry for letter T.
Some years ago, I decided to get a weekend job (asides my regular week day job) with an online radio station. It was something I knew I could do and would enjoy doing. For my interview, i was expecting a demo performance so I did a lot of rehearsal in front of the mirror, voice recording, updated myself with new music and current affairs etc. I got to the radio station and after answering basic questions, I was asked to create content (programme schedule) to cover seven days in the week including show title, timing, advert breaks, music breaks and all. I only wanted to co-host a show, not become a programme director. I am not sure how I did it, but instead of being discouraged, i put on my creative cap, imaginary skill and well i had to have learnt something from listening to the radio a lot. I probably impressed them because I was allowed to co-host a call-in weekend show as I had hoped for. I definitely learnt and discovered new things on the job like operating the equipment in the studio, learning how to use the software, taking calls in between shows, interviewing guests, updating the social media account while songs are playing……and even though I am not currently working with a radio station, I have all that experience stored in my Treasure trunk for when I am ready again. My point is, it is definitely ok to have more than one skill. The world is evolving, there are new inventions and softwares that are fast taking over human responsibilities. It’s crazy but it’s happening, people are becoming redundant and not having anything to fall back to. There is also retirement and handling everyday needs. In the wake of our reality, one remedial solution is to fall back on a skill you have acquired while in active service. Even if you still work, it is important to learn skills in areas that affect your family, career, budgeting, social life e.t.c. The idea is not to carry the ‘Jack of all trade, master of none’ tag, but to have abilities that can be valuable to you and your goals at the right time. We may not be able to foresee things, but we should be ready to take up new opportunities and face challenges once it presents itself. Be ready to apply for the new position at work just incase it gets vacant. Be ready to survive difficult situations. Be ready to give an impromptu speech. However, we can only be ready if we are equipped with the required skill. It is not enough to have tools you can work with, you must also know how to make use of the tools you have. Do not just learn, be very good at it. If only I could ….. I wish I knew how to…. Please complete the sentence with things you wish you could do or skills you wish you had. Do you have a long list? Then it is time to learn something new…. Imagine not being able to drive when there is an emergency and you are alone. Imagine not being able to administer basic first aid if you are alone with someone in need. What if you have not acquired any skill? It is never too late to start learning. Think about skills that will be beneficial to you, your kids, spending habit, your career and start learning gradually. Learn to write a script. Learn to write an official letter. I have heard people in science say they can’t be bothered about learning to write letters because it is not required in medicine or engineering. Really? Learn graphics designing. Your blog will thank you. Learn to create content for basically any field that interests you. Learn photography or any artistic skill. Learn how to write a business proposal. You little business should have a business proposal you know. Learn how to play scrabble. Perfect your negotiating and persuasive skill. Learn how to give an impromptu speech. Learn interior decoration and party planning. Doing it yourself will save cost. Get relevant training for your current job. You need that promotion…don’t you? Money and time management skills are definitely a plus. 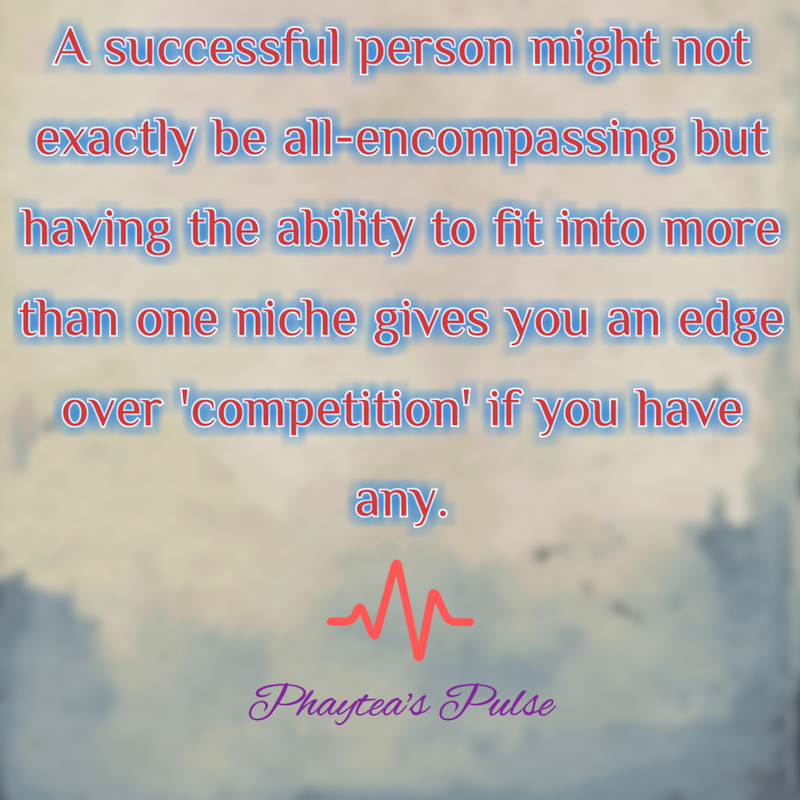 A successful person might not exactly be all-encompassing but having the ability to fit into more than one niche gives you an edge over ‘competition’ if you have any. Develop yourself, be a treasure trove of skills and get discovered. I have that in mind and you should too. What new skill have you learnt recently? Can you monetize your skill? Great job, I recently learned to write with my left hand, out of necessity as I broke my right thumb, nut eh, I’m proud of it. Congratulations on sticking to the A-Z challenge.I’ve learned a lot from you about consistency. It’s really cool that you prepared and took on the tasks at the radio station. That’s something I might one day try. And you’re right, learning a new skill and doing it well helps us become more confident about ourselves. Great insight! I have acquired a treasure trove of skills over the years, and that’s because I’ve always had a thirst for knowledge. Every job I’ve ever had, I took it upon myself to do more and learn more, and I recommend that attitude to anyone. You got that right: acquiring valuable skills is a necessity today, not an option. Really great incite. People need to evolve with the world, that’s so true. I myself and trying to learn a new skill, it’s hard and at times discouraging when things don’t go so well but, it has to be done. Nice. I am getting pretty good at designing my blog pictures. That’s new! This sounds amazing… I have a friend that hosts a radio show in London aside from her 9-5 and it is hugely rewarding! Go You! I’d love to learn how to swim. I feel like it will help me get over my fear of deep water. Nice post Phaytea! And congrats on the A-Z challenge. You have discipline and that is very nice. Thank you dear…hmmm…learning to swim is something i am about to give up on…..
I’m a geologist by trade, but in the last few years I paid my bills as a writer, translator and game designer – I turned my hobbies into a paying job when my “real job” expired. On the other hand, I find it very difficult to find employment because they tell me I have “too many qualifications” – I’m all for learning a lot of different skills, and I did it (and still do – I love online courses), but often the traditional workplace market is not ready to accept someone that “knows too much”. Cool one! Planning a radio show must’ve been so exciting. Excellent post again! There is plenty of useful skills on your list. 🙂 Lately I’ve learned to use Lightroom (yep, I’ve used Photoshop since I was like 12 but I got Lightroom for the first time this year haha). I’d love to become better in photography and editing in general because I have just started to sell my photos online and I know I could earn a lot more by training even harder. These are great ideas. I am excited to read U through Z. I really love knowing about the things that you are up to. And that’s so cool that you have been involved with radio. Have you thought about moving this over to podcast then? Just curious. Great ideas and insight. It doesn’t harm to learn something new. You never know what you may turn good at! Time management is a skill I learned that helps lots!!! My new skills is navigating the blogosphere! Previous Post Safety precautions for everyday life.